Running a small business is a struggle in and of itself. So how do you handle payroll, accounting, and taxes on top of running, growing, and developing a business? The team at Quick Draw Payroll understands the battle; we run our own business, too. When it comes to tax planning, preparation, and filing, we want you to stop worrying about the numbers and let us design a tax solution for your small business in Medina. No longer do you have to feel overwhelmed running a business and taking care of administrative responsibilities. 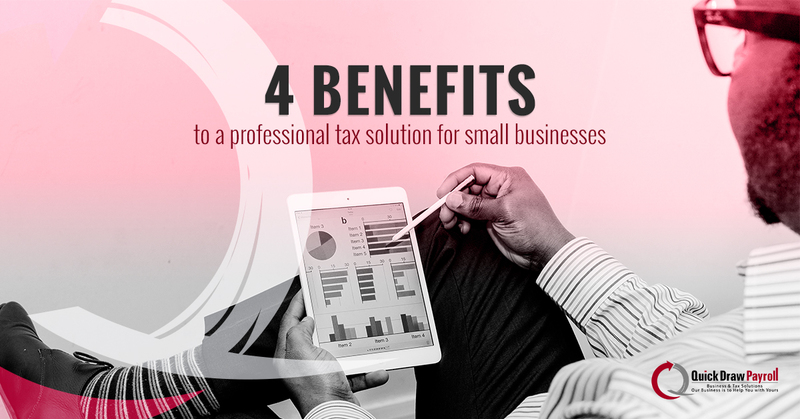 Do you want to learn the four benefits to hiring a tax professional? Continue reading to find out! Most small business owners fill out paperwork, submit, and wait. Our team at Quick Draw Payroll takes a proactive approach. Not only do we want to reduce your pay-in to the government, but we want you to save money, either for investing back into your business or buying that new truck you deserve. It’s imperative you don’t wait until the last minute to file. In most cases, those that wait until the last minute mess up their filing or miss something that will cost them. This is why our team plans ahead of time on how we will fill out and file taxes before tax season even arrives. Filling out IRS tax documents can be confusing. The terminology is not small business owner friendly, and a small mistake could cost you hundreds. Instead of spending time on wondering if you filled out your paperwork correctly, why not let someone like Quick Draw Payroll file for you? You’ll not only have your taxes filed, but you may reduce your tax pay-in. When you file, you may think your personal and your business taxes are similar. Unfortunately, they’re not. Depending on how you define expenses, costs, and revenue could change your returns and liability. Working with our team prevents you from paying in money you could keep in your pocket. Mistakes are common when small business owners file their taxes. You may be running a business, and the last thing you need is one more responsibility on your list of things to do. So you take the “good enough” approach to filing your taxes. Working with our team at Quick Draw Payroll ensures you of accurate and effective filing, so you can save money and pay less to the government. Our professionals want your small business to thrive, not wait for a return or have to pay extra on taxes because of a minor mistake. Although the initial cost of a professional tax service can be unappealing, the time you save in not having to plan, prepare, and file your own taxes is worth the upfront cost. Consider the opportunity cost. You can either spend time on your taxes, or you can spend time growing your business. When you spend time filing taxes, you’re not making any money. When you grow your business, you have a great potential to make money—the type of money to cover your tax services. We use our proactive approach to work with you, the small business owner, to save you money throughout the year. We work to lower your tax liability, so you can use your money for your business. Give us a call today to get started on your custom tax solution in Medina! We’re always glad to help.